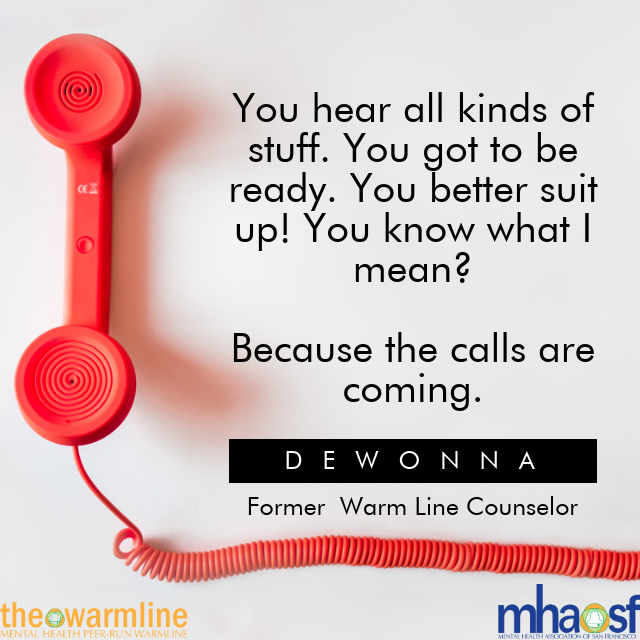 On the other end of our Peer-Run Warm Line are counselors with lived experiences with mental health challenges. Some have been homeless, imprisoned, or hospitalized. With this wealth of first-hand experiences, our counselors can provide emotional support to callers who have been in similar types of distress. Man, that feel good! Or if you have somebody call you and they’re in a distressful moment and they remember you. “Dewonna, thank you so much!” I used to hear that a lot, for me and my other co-workers. “Thank you for helping me through that.” Man, that is rewarding. No amount of money can make you feel like that.